Fairfield's Terry Corcoran launches a serve in the Mustangs' 3-0 win over Joel Barlow on Friday afternoon at Joel Barlow High School. The closest Barlow (0-2) came to a winning game was a tie at 4-4 in the first game as the coop, behind a consistent defense and a solid offense took 25-11, 25-18. and 25-14 games on their way to a 3-0 win and a 1-1 season record. "I think the best thing was how the team came together," said Fairfield Head Coach Garrett Covino. "This is a team that doesn't really have one superstar. One person is not going to be able to get it done. We don't have one person who is just going to be able to take over a game. It's got to be a team effort." Fairfield's effort started with the defense, which consistently frustrated Barlow. 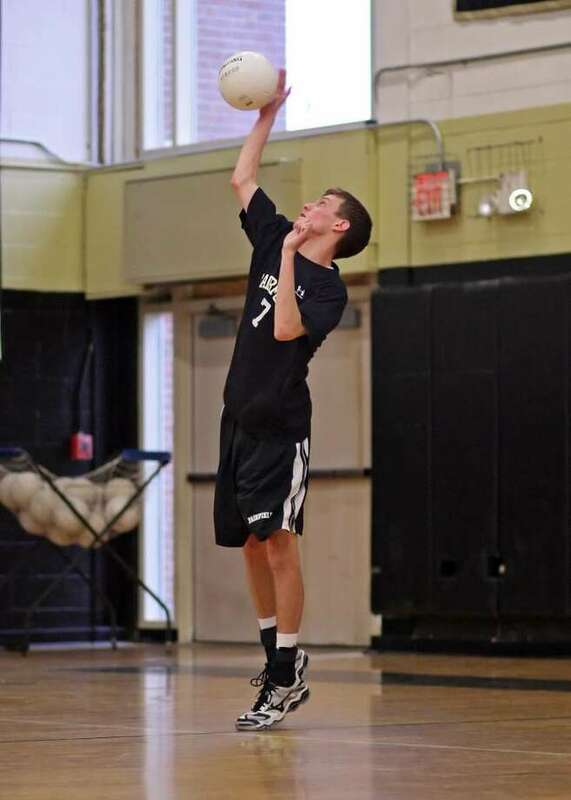 Led by libero Zach Segala (six digs) and middle hitter Sal Siciliano (three blocks) the defense limited the Falcons to a total of three three-point runs in the three games, while the offense put together seven runs of four or more points. The longest run of the day came in the first game when Siciliano took over service with the coop ahead, 11-7. Siciliano (11 service points, three aces, six kills) took a basically conservative approach. "I was just trying to get it in, looking at the ball and making good contact with it," said Siciliano. "I picked my spots, trying to get it not in the middle, trying to get it to either one or five and hope for the best." When Siciliano's service run ended, Fairfield led, 18-8. Then the defense stepped up again, limiting Barlow to three points for the rest of the game, which ended with Terry Corcoran (10 service points, five aces) leading a co-op four-point run. Covino pointed out a major improvement in the Barlow game over Fairfield's opening-day loss to consistent state semifinalist Lewis Mills. "The biggest thing today was the passing was much better," said Covino. "We were able to run an offense on our passing. It's nice when you get a pass on the net or even inside the ten foot line, where you're able to run a full offense. We have the choice of three hitters or even five hitters if we need to. Today almost every time, we had full options, the full array of our arsenal, which was really nice." One of the major options in the co-op's arsenal is outside hitter Brett Krumins (five kills), who saw a secondary benefit of the fine passing from the defense: consistently perfect sets from Dillon Otten (14 assists). "Dillon's amazing," said Krumins. "He tries to mix it up all the time between me, Sal, and Pat [Kerrigan], whoever's in the middle. He puts it on target where I'll be able to hit it. He knows how high I can jump, he knows where I want it and he puts it exactly where I want it. "It's straight overall teamwork," Krumins continued. "We all know we trust Dillon, we trust everyone on the team to make passes, to get Dillon the ball, to let us be able to hit it." Otten noted with pleasure that although winning on Friday meant no team practice on Saturday, the main motivation for the coop was atonement for opening day. "We came into this game and we really wanted to win cause we lost pretty bad at Lewis Mills," said Otten. "We came here really wanting to win and we played really well--not as well as we wanted to--but we still got it done."